I have always loved stationery stores. It’s not the smell,exactly I think I loved the stores first, then loved the smell by association. It’s a dry, subtle smell, really rather neutral if you stripped away the memories, but it still makes me happy nonetheless. I don’t expect everyone I meet to be equally happy in stationery stores, or all that interested in pen reviews. I plan to return to my more usual fare in the next post. Recently I’ve been putting together a collection of pens to carry with me in various small pouches and bags (notions and other. Here’s what I’ve got at the moment, plus one which is on the way. It’s an inexpensive, disposable fountain pen. At under $5 it was the perfect pen to pick up and cart around as a way to explore whether or not I could manage to run a pen dry before I lost it. The reservoir is noticeably lower now, so the experiment seems to be working. This is the only full sized pen I’m discussing today. It’s about 5 1/2″ long capped, 5 3/4″ when ‘posted’ (with the cap positioned on the non writing end of the pen). I’ve used fountain pens in the past, and was worried that this one might leak. It doesn’t, possibly because it doesn’t have a removable cartridge to install badly. Nor does it have that ‘scratchy’ feeling I had half expected. I like this pen a lot, but will probably replace it with something more permanent when it does run dry. Yup, it’s a space pen! 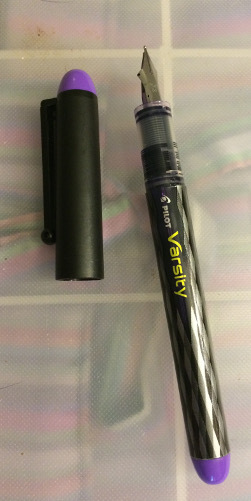 Pressurized refill cartridge, writes upside down or underwater or in space or wherever. 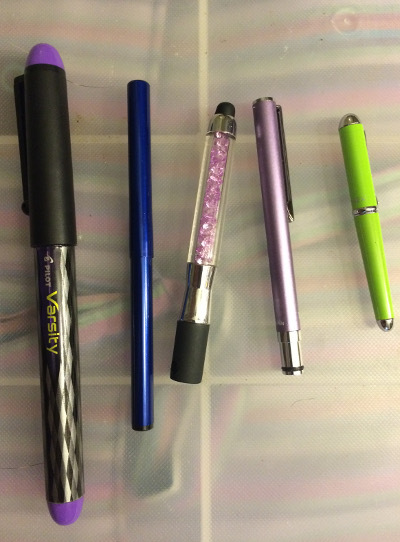 It is 4″ when closed, 5 1/4″ posted, it’s the smallest and least expensive space pen I’ve found. The Bullet is about the same length, and possibly prettier, but it’s also much wider and about twice as much. The Stowaway is $10 at REI. This was the first ‘mini pen’ I got, and it convinced me that it was possible to do them right. It writes much more smoothly than most ball point pens do, and feels like a full sized pen in the hand. I don’t know that this little glittery pen has a name, I found it at the counter of the FexEx/Kinko’s store. It came with a keychain attached, but I removed that so that it would fit in a small notions pouch. Small is right, here. It’s 3 1/4″ long. Since it’s made to go on a keychain it does not post. The stylus works on some touch screens but not on all of them. I don’t know what the glitter is all about, and there’s no obvious way to refill the pen. Not too unreasonable, considering that I got it for $2.75. I got it to fit in a tiny notions case, and I’ve found pens I like more which are small enough, so I’ll probably replace it with something a bit larger when it runs dry. Another tiny pen for under $10. I was a little disappointed with the ‘ball point’ grittiness when I first got this one, but either I got used to it quickly or it worked out with use. This one is almost as slender as the Stowaway, but is only 3″ long when capped. It posts at 5 1/4″, so is a pretty good length for hand feel. Ohto manufactures refill cartridges for it. It’s the perfect length for the Lantern Moon knit-kit notions pouch. For $12 this pen set me back more than any other on this list. It’s crazy small, about 2 1/4″ long capped, 2 3/4″ posted. I can write with it OK, but it wouldn’t be comfortable as a serious letter writing or journalling pen. On the other hand, it fits beautifully into my Nancy’s Knit-Nacks case. Do you have a favorite pen? Do you like cheap disposables or something more substantial? How about some of the new, super modern pens out there, anyone use those? 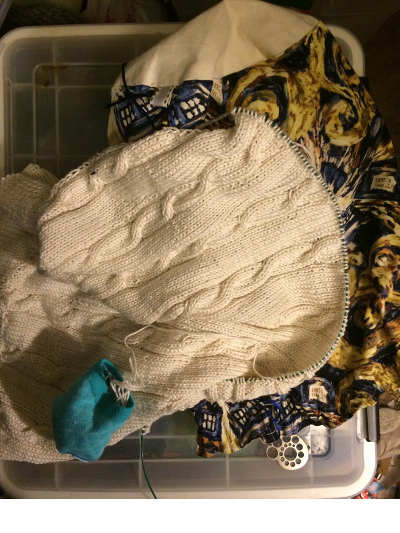 I’d love to hear what you think, but I’ll probably be back to blogging about knitting soon. It’s been almost a week since I posted the Vexing Socks pattern. More than 500 people took advantage of the coupon code, and three missed it. People visited the blog to get the coupon code, and many of them took a look around the blog. I don’t know how many ‘followed’, but there wasn’t a noticeable uptick in comments. I had one individual ask if I would knit the socks for him. (The answer to that was no). Two of my test knitters linked their FOs to the pattern in the Ravelry database, and it’s in 9 queues with 96 favorites. Not bad. If I do publish any more patterns I think I will do the coupon code thing again, but just for three days (since the vast majority of the activity on the pattern took place over the first three days). I think, on the whole, it went well. I finally succeeded in using the crochet cast on for Kris Hanson’s Dino Cap. I’m having a lot of fun with this project. The toddler’s parents are big fans of the Washington NFL team, so the cap is in burgundy and gold. I’ve called my Ravelry project “The Dino Who Shall Not Be Named” in honor of the current controversy. 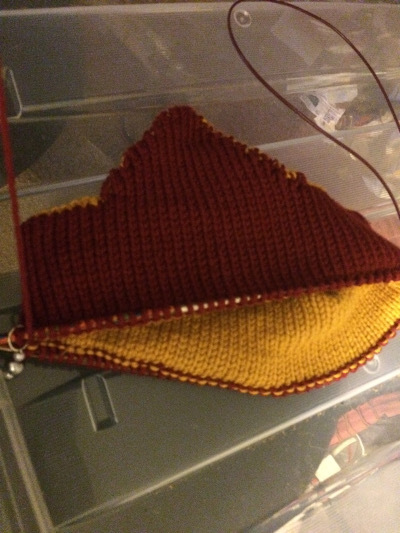 I cast on in gold, but switched to burgundy in the middle of the first earflap (just after the decreases). Since the short rows in the flaps are done without yarn overs or other methods of smoothing there is a built in picot edge, and it makes a nice transition point. I switched back to gold and did the same process for the second flap. Knit to the same depth in burgundy as I had in gold, and attached the working edge to the cast on edge with a three needle technique. I’m rather pleased with the results. That cool snail thing you’re seeing is a Debra’s Garden needle gauge. The blue blob is a yarn bra – which is pretty helpful when you’re working with cotton in particular. enjoying it very much. I’ve already switched that project into the new project bag. It did still fit into the previous bag, but the Illustriation shawl was cramped in the next smaller bag, so I did a bit of shuffling around. I also had to admit that the Altoids box was no longer working as a notions tin. I had blown the hinges on one, and replaced it with a new Altoids tin, but even handling it gently I had trouble getting it closed consistently. So I replaced that with a Lantern Moon knit aid case. I already mentioned that I had ordered up a Namaste Better Buddy to have one notions case per project bag, and that came in as well. My sets obsession has driven me to order yet another Debra’s Garden gauge so that every Project Bag which is actively in use can have one clipped to it. I know it’s pretty silly, but that’s what I’m doing with it. I could go off and talk about the pen and notebook thing, but I’ll save that for another time. I didn’t win the Thick and Finn, Swan’s Island or Kangarth knits giveaways. 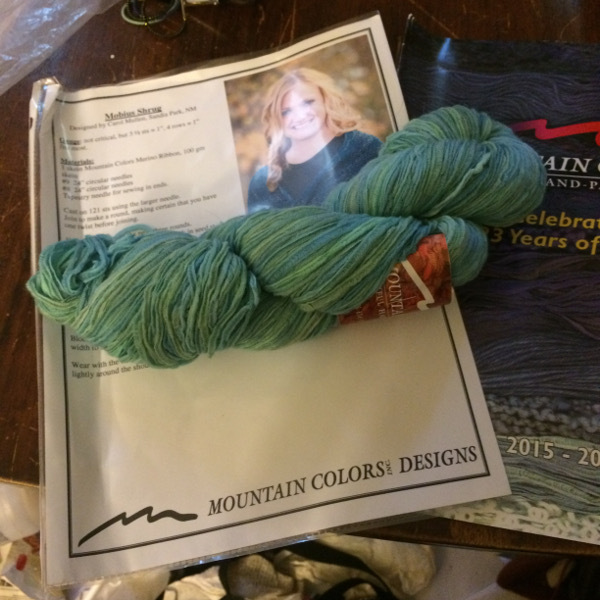 I entered a giveaway from Hands Occupied for a skein of Silverspun yarn (30 October). Thank you for joining me on my design and publication journey. The Vexing Socks are now available on Ravelry for $1.99 (or free for this week only, if you use the coupon code below). I’ve had a great time designing these, and I want to thank all my Ravelry testers, lambie, Mahgret, FugueStateKnits, Annewswissknits and ginnynd25 on Ravelry. Some of my testers did drop out due to time pressures and/or frustration with the testing process, but I think I’ve learned some valuable lessons in how to run tests in the future, and the pattern is more clearly written thanks to their feedback. I want to thank all of my blog readers as well. 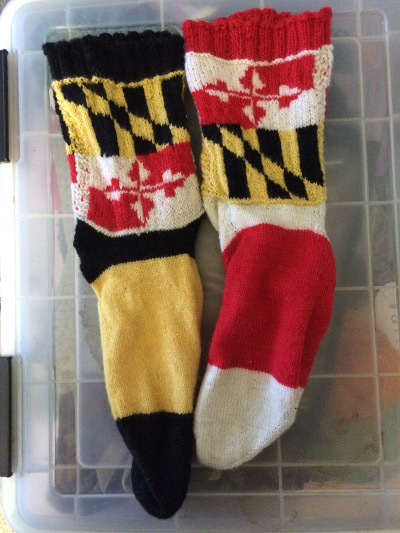 The socks will be free through October 24 (EST) with the coupon code Calvert Crossland. If you use the coupon code, please favorite and/or queue the pattern as well. At least, one eBay vendor thinks I am. I asked him about the other package. Tracking said it had been out for delivery several times, but neither he nor I had seen it. He agreed it was strange, and suggested I call the post office. So I phoned the office at 21044 The postal worker hummed while she was logging into the system (I told her she was giving me personalized hold music) and then got very confused, and went to speak to her supervisor (the system didn’t give me any hold music at all, just periodic buzzing…) and then came back and explained what the issue was. She said the package was addressed to USA, 21045, and nothing else. * At the time of this post that listing has been updated with a length half an inch longer than the previous one, so probably not). The Ravelry Shop will have been up for a full week tomorrow. 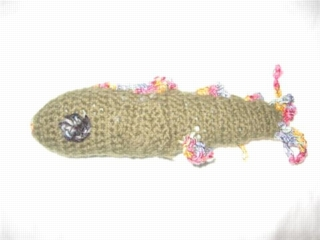 The fish pattern had four downloads on the first day (including my own ‘trial’ download) and two since. Now to publish the Vexing socks, edited to acknowledge the testers, and give it a promo code, which I will publish here. I will have that done by Sunday, 25 October. Well, the not-ready-to-talk-about project has hit a snag. I feel that I’m handling it pretty well, but I’m not quite ready to blog about it yet. Other areas of my life aren’t much easier. This morning DH dropped me off at the Motor Vehicles Express office. It’s a mile and change from home, across the street from a weekly coffee-and-yarn meetup I like to go to. The office had barely opened, so there wasn’t too much of a line. The clerk couldn’t give me the duplicate title I needed, but she could write down the information I needed to order it online. This was about what I’d expected, so I thanked her, tucked the slip of paper in my wallet, and went on the knitting meet up. The meet up was fun. I don’t know the other knitters (and crocheter) very well, but I’m starting to. One woman there has a daughter who’s been a PCV twice, who is just starting a job teaching English in Indonesia. We met each others, and both daughters, at previous meet ups, so we swapped stories and that was good. I tried multiple times to create a provisional cast on for a lined toddler cap. Honestly, I should be able to do this by now without referring to the internet, but no… no such luck. I gave up and worked on the cricket sweater for my husband instead. After I walked home, the paper was gone. It must have fallen out of my wallet when I got my coffee. Totally my own fault, but I didn’t want to walk down and back again so I called it a loss and I’ll just have him drop me off again tomorrow. This afternoon I got the letter Abby sent me before leaving for Senegal. It was lovely, but I found myself crying again. This is going to be hard. So now I have four WiPs, one for each project bag. I expect the sweater is going to get too big for the largest bag pretty soon. Even if it doesn’t, I have bought yarn for the Aidez, which is much bulkier. 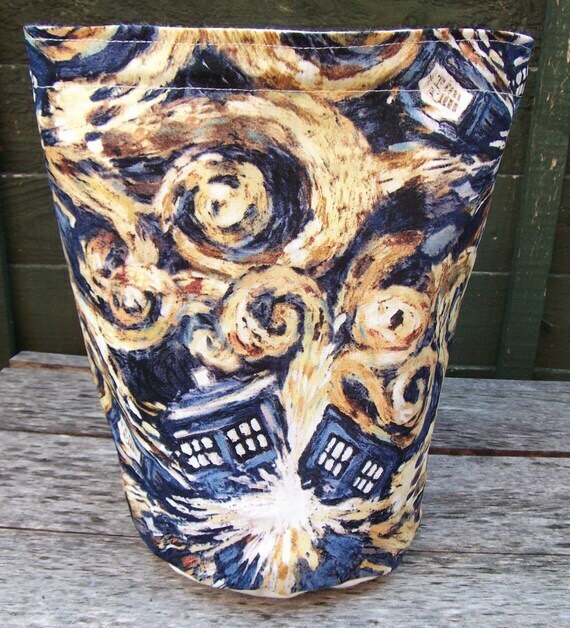 So I ordered a new project bag. Honestly, I think missing Abby has prompted a big bout of ‘retail therapy’. I invested in a second CritSuccess counter ring (this one in blue – so pretty!). I also got a swift cover from Slipped Stitch Studios, because I’ve been kicking myself for missing the chance to get that one in the Exploding Tardis print. Anyway, I ordered the Namaste online, because I noticed that retailers were kind of low on stock. Then someone at the knitting group told me that they’re stopping production because the Pleather doesn’t wear well. Oh well, we’ll see how long I can get mine to last for. Following a conversation on Ravelry, I’ve decided to add a pen and notebook to each of my notions bags. 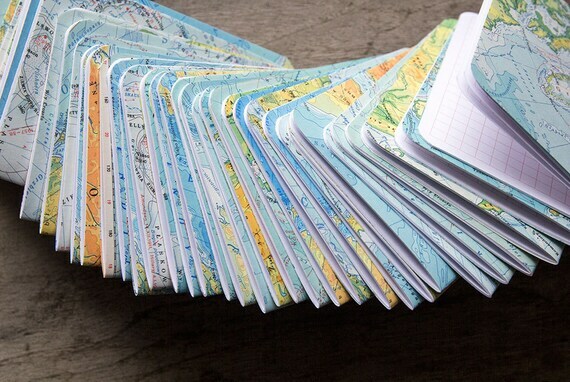 Post it notes for the small boxes, handmade notebooks from Etsy for the larger ones. For pens I’ve gotten a Fisher Space Pen stowaway (a neat, compact pen), an Ohto Petit B (a really pretty, tiny pen), a Xonex Piccollo (wow! 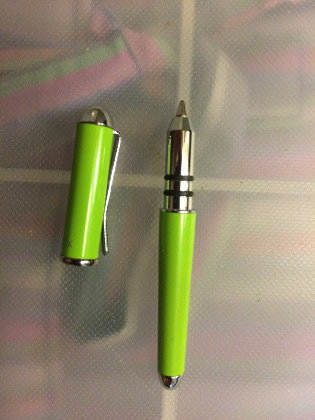 is this thing tiny) and a keychain pen/stylus (the last of which I found at the checkout at FedexKinko’s). 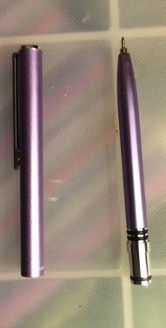 The Namaste buddy is bigger than any of my current pouches, so I’ll probably get a larger writing implement for that. I have my Ravelry Store up and running. I’ve transferred the free pattern from my soon-to-be-defunct personal web page to a PDF document, and it’s available for download. If you’re curious (or like Dr Seuss inspired fish) please download it (linked from pattern title) and let me know what you think. My brother-in-law is a lobbyist for the cod fishing industry, so when my niece Nora was born I wanted to give her a stuffed cod. That sounds pretty weird, but the whole family has an off-beat sense of humor, and cod do definitely have a Dr. Seuss fishy cuteness about them. (Photo below is the fish I gave her, to the right is a cod from the Kunkel Aquatic site). I found a bunch of cod related limericks online, and wrote one more, and put together a nice little gift package. All his life with a name like the scrod. It’s nice, but it just isn’t Boston. Here you can get cod. There you can get scrod. So you will probably go there more often. I’m going to keep an eye on the Ravelry store for about a week before uploading the Vexing socks, just to have time to work any weirdness out (on my end, Ravelry has been doing it’s part for years). Just a few days after talking about not wanting to overshare, I’m back, hopefully not quite oversharing. There are some changes coming in my life, small changes which might possibly be the start of something big. I don’t want to give out too many details because I might jinx it… it might not be the start of anything at all. If it is the start of something, it could, very likely would force me to rethink the way I blog, to redefine (or possibly really define for the first time) what I’m blogging for. Something happened this week. Something small, but exciting. It really shook me up in a not-entirely-bad way, and brought me face to face with some deep seated fears and insecurities which I hadn’t had to deal with in a long time. I’m not going to say much more about it, except that I did not back down. I did not back down. In addition to the not-talking-about-it stuff I got a call last night, from Abby, around 7PM my time (11PM hers). Actually it was a ring-and-hangup, which is the signal that I am to call her. She’s living with a new ‘host family’ in Senegal, the food is unfamiliar, they’ve changed her anti-malarial meds and she was feeling really, really bad. 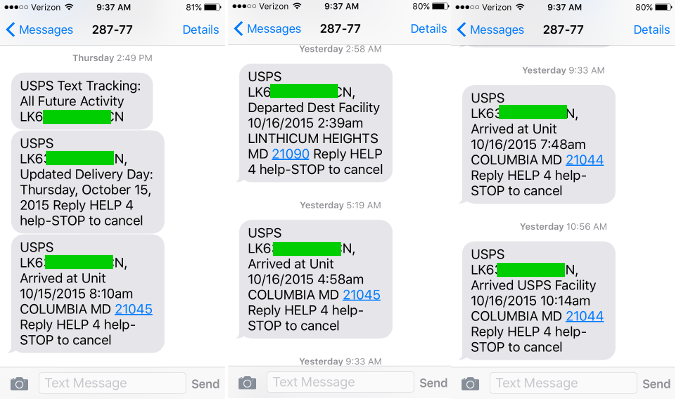 I knew I was going to get that call sooner or later, but I guess I was hoping for later. I think I handled it pretty well, and she was able to go back to bed. (Yes, she’s in bed before 11 these days, they work the volunteers pretty hard…) I’ve gotten two pictures of her departure from the States and arrival in Senegal, but nothing of where she’s living now. I just keep telling myself she’s doing fine, and I think I almost believe it. Enough of That “Real Life” Stuff, How About Yarn? I need to follow through and set up my Ravelry store. Once I do that, I’ll publish the Vexing Socks pattern and put a (limited time) coupon code here on the blog. I’ve been dragging my feet long enough, so consider this my public commitment to get the shop up within a week. I’ll test it out with a free pattern, then post the socks. I didn’t win the Mooglyblog Yarn Happy giveaway. I joined their Cast Off Chemo giveaway (13 October), the $200 worth of yarn from Swans Island giveaway (drawing date unknown) and a drawing for 2 skeins of Evonwee yarn (3 November) and a skein of Willow Daily DK yarn from Kangarth Knits (20 October).